Fishing Long Island Sound covers all the best shore- and boat-fishing locations on Long Island Sound, including Connecticut, Long Island’s north shore, Fishers Island and New York City waters. GPS coordinates, not listed in similar books, are provided for numerous navigational markers, boat launches, state parks and fishing hotspots including reefs, wrecks, beaches and piers. 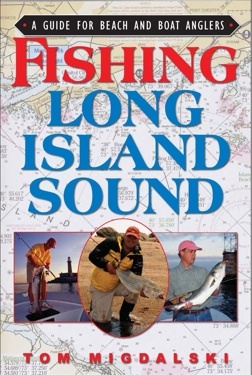 How-to tips on tackle, technique and strategy are included, plus all bait-and-tackle shops near Long Island Sound and contacts for additional outdoor recreation information in every town or city. A bonus section lists over 60 important and useful websites concerning all aspects of the Long Island Sound environment. of a successful outing on this special body of water. Tom Migdalski is the author of Fishing Diamond Jigs and Bucktails and is a regular contributor to Sport Fishing, Salt Water Sportsman, Fly Fishing in Salt Waters, Saltwater Fly Fishing, Center Console Angler, Shallow Water Angler, New England Game & Fish, On The Water and The Fisherman.